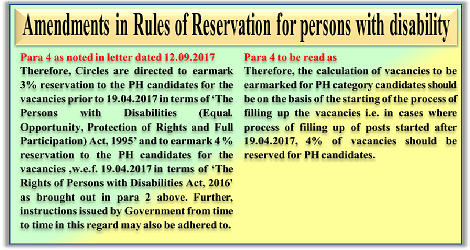 Subject: Reservation for Persons with Disabilities. Therefore, Circles are directed to earmark 3% reservation to the PH candidates for the vacancies prior to 19.04.2017 in terms of ‘The Persons with Disabilities (Equal. Opportunity, Protection of Rights and Full Participation) Act, 1995’ and to earmark 4 % reservation to the PH candidates for the vacancies ,w.e.f. 19.04.2017 in terms of ‘The Rights of Persons with Disabilities Act, 2016’ as brought out in para 2 above. Further, instructions issued by Government from time to time in this regard may also be adhered to. Therefore, the calculation of vacancies to be earmarked for PH category candidates should be on the basis of the starting of the process of filling up the vacancies i.e. in cases where process of filling up of posts started after 19.04.2017, 4% of vacancies should be reserved for PH candidates.